[232 Pages Report] The exterior wall systems market size is projected to grow from USD 173.93 Billion in 2016 to USD 278.82 Billion by 2022. The market is projected to grow at a CAGR of 8.43% during the forecast period. The base year considered for the study is 2016, and the market size is projected from 2017 to 2022. The report aims at estimating the market size and future growth potential of the exterior wall systems market across different segments material, type, end-use sector, and region. The other objectives include providing detailed information regarding the main factors influencing the growth of the market (drivers, restraints, opportunities, and industry-specific challenges). It also aims to study the individual growth trends, prospects, and contribution of the various segments to the total market. The study also analyzes opportunities in the market for stakeholders and details of the competitive landscape for the market leaders. The study strategically profiles key players and comprehensively analyzes their core competencies. The research methodology used to estimate and forecast the exterior wall systems market begins with capturing data on key vendor revenues through secondary research and associations such as the Environmental Protection Agency (EPA), India Brand Equity Foundation (IBEF), CIB (International Council for Research and Innovation in Building and Construction). Vendor offerings are also taken into consideration to determine the market segmentation. The bottom-up procedure was employed to arrive at the overall size of the global exterior wall systems market from the revenues of key players. The market ecosystem includes various stakeholders involved in the supply chain of the exterior wall systems industry starting from raw material suppliers, research & development, and manufacturing. Post this, the marketing and sales of the products take place which is only possible if an efficient distribution channel is developed. Finally, the end products are made available to the consumers. The global market for exterior wall systems market is dominated by players such as Nippon Sheet Glass (Japan), Saint-Gobain (France), Asahi Glass (AGC) (Japan), Alcoa Corporation (US), PPG Industries (US), 3A Composites (Switzerland), Sika (Switzerland), Etex (Belgium), and Owens Corning (US). 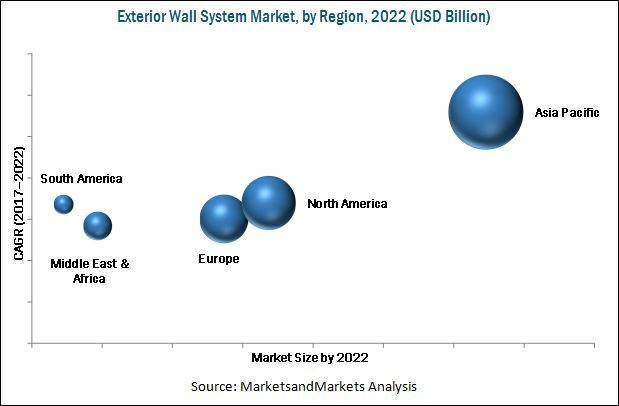 MarketsandMarkets projects that the exterior wall systems market size will grow from USD 186.02 Billion in 2017 to USD 278.82 Billion by 2022, at a CAGR of 8.43%. This market is expected to witness considerable growth due to the growing awareness about environment-friendly façade systems and the increasing need for efficient building thermal management. Additionally, regulatory frameworks promote the use of exterior wall systems. The market has immense opportunities owing to the emergence of new technologies and the growing construction industry in emerging economies. On the basis of material, the exterior wall systems market is segmented into glass panels, ceramic tiles, vinyl, metal panels, bricks & stones, fiber cement, gypsum/plasterboard, EIFS, wood boards, fiber glass panel, HPL boards, and others which include (magnesium oxide board and cement boards). The glass panel segment is projected to grow at the highest CAGR from 2017 to 2022. The dominant market position of this segment can be attributed to the rising demand for high-performance and value-added glass panels. The opportunities of value-added glass are expected to grow in the future due to recent changes in building regulations for energy efficiency in most countries, which will eventually drive the demand for glass panels in the exterior wall systems market. The exterior wall systems market, by type, is segmented into ventilated façade, curtain wall, and non-ventilated façade. The curtain wall segment is projected to grow at highest CAGR during the forecast period. The growing demand for curtain wall is attributed to factors such as the reduced construction time they offer as the duration of the fabrication processes is shorter. Curtain walls also provide protection from harsh weather conditions, while reducing the damage caused by natural calamities such as earthquakes. The exterior wall systems market, by end-use sector, is segmented into residential commercial, and industrial. The commercial segment is projected to grow at highest CAGR during the forecast period. The growth in the commercial segment is attributed to the rise in standardization in the architectural & infrastructural industry, increase in the number of green buildings, energy-efficient buildings, and superior properties such as durability, water- and wind-resistance, easy maintenance, and weather-proof properties that exterior wall systems offer. The market in developed countries is maturing; the Asia Pacific market particularly the developing markets in countries such as China and India is projected to grow at the highest rate from 2017 to 2022. In 2016, the Asia Pacific region accounted for the largest share of the global exterior wall systems market. This region is a hub for foreign investments and the booming residential & non-residential construction sectors, largely due to the low-cost labor and cheap availability of land. The increase in demand for exterior wall systems can be attributed to the rising population with high disposable incomes and construction opportunities in this region. Increasing demand for sustainable & eco-friendly construction also drives the exterior wall systems market in the region. Environmental pollution from glass, aluminum, fiberglass, fiber cement, plaster board, magnesium-oxide board, PVC board manufacturers, and the chemical industry through toxic emissions and other forms of pollutants has been a cause for concern, as these industries provide the raw material for exterior wall systems. This is posing a restraint for this market. The global exterior wall systems market is dominated by players such Nippon Sheet Glass (Japan), Saint-Gobain (France), Asahi Glass (AGC) (Japan), Sika (Switzerland), Alcoa Corporation (US), PPG Industries (US), 3A Composites (Switzerland), SCG (Thailand), and Etex (Belgium). 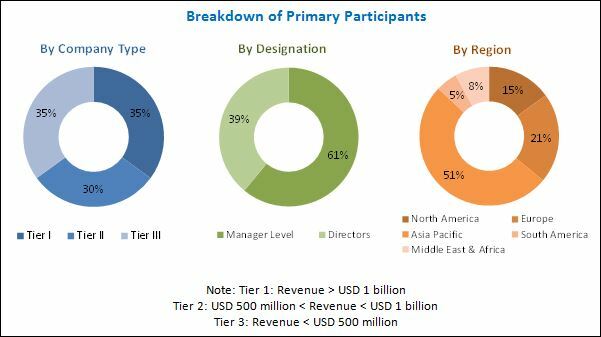 These players adopted various strategies such as new product launches, expansions & investments, joint ventures, and mergers & acquisitions to increase their share in the exterior wall systems market.